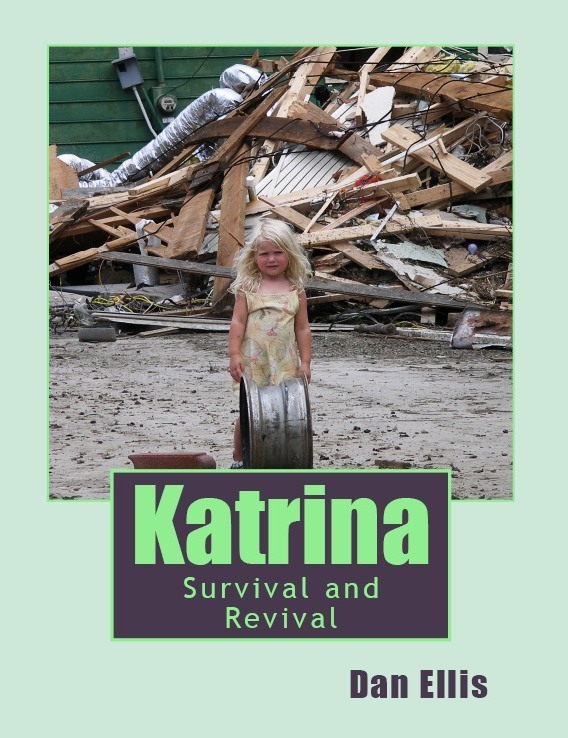 "Katrina - Survival and Revival"
The book, “Katrina: Survival and Revival” is centered on the city of Pass Christian, a city which was previously devastated in 1969 – August 17th. It was 36 years later, in 2005 on August 29th, just after 8: a.m. that the city was struck again by an even greater blow. This time destroying almost 4/5ths of the small coastal village that had roots planted through history from 1699 when d’Iberville and his brother Bienville arrived at the Gulf coast in seeking the mouth of the Mississippi River. This story is about the Evacuees who voluntarily left, or who were instructed to leave the area. In addition, those who remained to stay the night to face a brutal morning. It is also a story about the many volunteers who aided in the early months assisting in providing basic care products and toiling shoulder to shoulder in cleaning out homes that could be saved. There were also volunteers who aided in rebuilding homes that needed replacing for many who had no Flood insurance. This story is also about the stalwart governing officials who were also fated with demolished or damaged homes, but stayed the course to provide direction to the broken city and its inhabitants as well as the Evacuees who slowly were returning to join in the recovery processes. Life became one of living in trailers, some in isolated areas, — the more provident being able to align their FEMA supplied trailers on their property thereby tapping into electricity, water, and sewerage for the duration of renovating or rebuilding their former residences. This story is also about the out of town and out of reach family members and friends frantically seeking their loved ones and only knowing what they had seen on television which was mostly naught for the Pass. Though the progress was exceedingly slow in the first years, since 2010 the city of Pass Christian has blossomed to gain the promise of becoming once again a Paradise. Katrina: Survival and Revival is Dan Ellis’ latest book. It is centered in Pass Christian, with the story unraveling from varying points of interest recorded in journal style: First, the Storm’s aftermath of destruction and the “military” take over with curfews installed. Then, the Survival period — the storm victim, the evacuees who return home to a trailer existence, the evacuees who maintain their desire, but not able to make a timely return. Then the overtones of the City officials who were in command and their influences upon the Clean-up. New regulations were imposed resulting in higher fees and costlier insurance. Individual stories and a horde of emails frantically sent during the early days, weeks and months — virtually display the fears, frustrations, concerns, disappointments, anger — as heated passions are let loose in numerous queries and countless communiques. There are 278 pages filled with more than 300 descriptive photos.